Not every vacation has to be sunsoaked or all-inclusive. Here are some fun, fresh ideas for how film lovers, music fans, and history buffs can spend their hard-earned vacation days in 2017. If you want vacation memories that last a lifetime, skip the amusement parks, bed and breakfasts, and other tourist traps. Instead, choose a destination that plays to your passions. Engaging with something you’re passionate about is a proven way to relax and restore yourself. We’ve all heard of the overplayed national stadium tour, where baseball fans visit the venues where their childhood idols played the game. There’s currently a company that specializes in that experience, taking temporary VIPs to see historic ballparks like Fenway and Wrigley and rolling in some extra incentives to buy in. But let’s try something a little bit different. Here’s are some refreshing ideas to guide your vacation plans and give music, movie, and history buffs the thrill of a lifetime without even boarding a rollercoaster. Memphis—Step back in time to the early days of rock ’n’ roll with a trip to Memphis and tours of Graceland and Sun Studios, where many of the first records by Elvis, Carl Perkins, Johnny Cash, and Jerry Lee Lewis were cut. Then take a spin of the Stax Museum of American Soul Music to learn more about legendary artists like Otis Redding and Isaac Hayes. At night, catch a live show at one of the many rock and blues clubs on Beale Street or just soak up the street’s vibe. Seattle—Seattle is the birthplace of Jimi Hendrix and the late-’80s/early- ‘90s grunge scene and you can learn more about both at the EMP Museum. Be sure to make at least one stop of the iconic Sub Pop Records store to pick up some new albums, then check out the latest Pacific Northwest bands at the city’s thriving clubs like the Showbox or Cafe Racer. Liverpool—For Beatle buffs, a trip to the famous port city is a must. To be sure you don’t miss a thing, try a Fab Four Taxi Tour, which will take you from Strawberry Field to Penny Lane to Abbey Road–as well as all four members’ former homes—all set to a Beatles soundtrack. 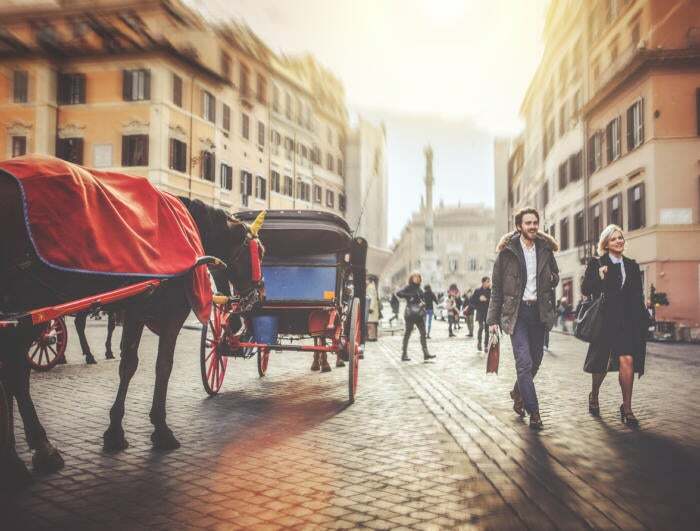 Rome—As if you needed another reasons to visit one of the world’s most romantic cities, the Italian capitol has been a cradle of arthouse and mainstream cinema. It makes no secret of that fact, strategically placing informational plaques at popular film sites. A trip here should include stops at the Spanish Steps at Piazza Spagna where Matt Damon arranged a meeting with Gwyneth Paltrow in “The Talented Mr. Ripley;” The Bocca della Verita (“Mouth of Truth”) where Gregory Peck and Audrey Hepburn tested their truthfulness in “Roman Holiday”; and the Trevi Fountain where Anita Ekberg took a dip in “La Dolce Vita.” And be sure to take a tour of Cinecittà Studios, were you can still view the sets of many Italian and American classics. Cities like Philadelphia, Boston, and Gettysburg are first stops for anyone who really enjoys American history. But let’s say you’ve already done the Liberty Bell and Paul Revere’s house. Here’s where your history geek itinerary should point you next. Charleston—Site of the first shots of the Civil War, Charleston, South Carolina has plenty to offer history lovers. Here you can still visit wartime landmarks like Fort Sumter and the long-lost Confederate submarine H.L. Hunley. But the city itself is a gateway to the past, full of gas-lamp-lit cobblestone streets and well-preserved Antebellum architecture. Newport—The Rhode Island costal town is home to more colonial buildings than any other U.S. city. Among these are the Redwood Library and Athenaeum, built in 1747; the Touro Synagogue—the country’s oldest synagogue—completed in 1763; and the Newport Colony House, on whose steps the Declaration of Independence was read in 1776. You can also visit the Newport Mansions, where Gilded Age elites including the Vanderbilts and Astors spent their summers. Whatever destination you settle on, a good 2-in-1 device like the HP Envy x360 or Lenovo Flex 4 makes an excellent travel companion. These versatile computers can help you research, plan, and guide your trip and feature plenty of storage for photos and video so you can relive your vacation for years to come. And remember, you don’t have to be limited by the choices here. Planning a vacation around your passion is limited only by your interests and enthusiasm. With some imagination and the right tools, you’ll be sure to design an experience you’ll never forget.